Sergeant E-5 Joseph P. Castagna was born in Brooklyn, New York on 29 September 1948 to Mr. Philip J. Castagna and Mrs. Rose Castagna. Joseph's siblings are brothers Philip, Peter, Vincent and sisters Mrs. Rosanne Marianni (nee: Castagna) and Mrs. Jeanne Carlson (nee: Castagna). Joseph attended both Elementary and High School in Brooklyn, New York, prior to being inducted into the United States Army. After completing his Basic Training and Advanced Individual Training, as an Infantry Soldier, he received his orders for service in the Republic of Vietnam. Sergeant E-5 Castagna started his tour of duty in the Republic of Vietnam on 19 April 1968 and was assigned to Company E 50th Infantry Long Range Patrol, 9th Infantry Division in the Mekong Delta. 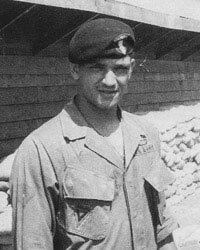 On 23 June 1968 Sergeant (then Specialist 4) Joseph P. Castagna while serving as a Team Scout with Company E 50th Infantry (LRP), on a combat mission near Tan An, distinguished himself. When snipers engaged his eight man reconnaissance team, Specialist Four Castagna continually exposed himself as he moved from one casualty to another administering vital first aid and assisting in their evacuation. Specialist Four Castagna's heroic actions were in keeping with the highest traditions of the military service and reflect great credit upon himself, the 9th Infantry Division and the United States Army. Sergeant (then Specialist Four) Joseph P. Castagna was awarded the Army Commendation Medal with "V" Device for heroism in connection with military operations involving conflict with an armed hostile force in the Republic of Vietnam for his aforenoted heroic actions. On 21 December 1968 while on a reconnaissance operation in Dinh Tuong Province, Republic of Vietnam, Ranger Castagna was killed in action as a result of being hit by enemy small arms fire. Captain Dale Dickey, Commanding Officer of Company E 50th Infantry (LRP), in corresponding with the parents of Ranger Castagna wrote, "Joe was a forthright, loyal soldier who won the respect and admiration of all who served with him. You can take pride that Joe was an outstanding soldier who was a great credit to his country." Prior to his death Ranger Sergeant Joseph P. Castagna had been awarded the following: National Defense Service Medal, Vietnam Service Medal, Vietnam Campaign Ribbon, Combat Infantry Badge, Sharpshooter Badge with Rifle Bar and the Marksman Badge with Automatic Rifle Bar. After his death Ranger Sergeant Joseph P. Castagna was Awarded Posthumously the following: Bronze Star Medal, Army Commendation Medal with "V" device for Heroism, Purple Heart, and the Good Conduct Medal. Specialist Four Joseph Castgana was also Posthumously Promoted to Sergeant E-5 effective 20 Dec 1968. Sergeant Joseph P. Castagna was further Awarded Posthumously the Military Merit Medal and the Gallantry Cross with Palm by the Government of the Republic of Vietnam. Ranger Sergeant Joseph P. Castagna was a Citizen Soldier who served his country with PRIDE, DEDICATION and HEROISM and gave up his LIFE for his fellow RANGERS so that they might achieve the RANGER OBJECTIVE. RANGERS LEAD THE WAY!!!! USMRA is an equal opportunity source of assistance. USMRA does not discriminate based on race, color, nationality, religion, gender or sexual orientation.